The department of comparative medicine manages OMRF’s animal care program, which has three separate facilities. It has been accredited by AAALAC International since 1971 and is a member of the Vivarium Operational Excellence Network. 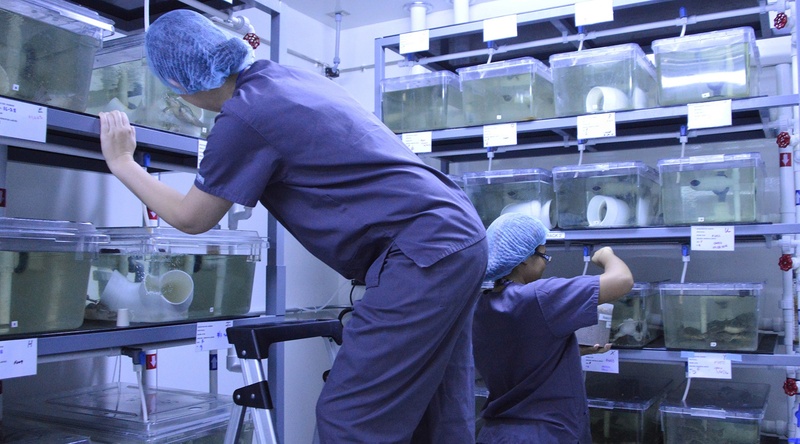 The department manages an average of approximately 5,000 cages of mice and 1,200 tanks of fish. Our cage rates rank among the lowest in the country, and we are capable of housing and maintaining rats, frogs, other rodents and other species as needed. For all rodents, the quality of housing is barrier-level with sterile caging and bedding, irradiated feed and chlorinated RO water. Comparative medicine offers the capability of ABSL-2 containment for different projects and can accommodate ABSL-3 housing in collaboration with Oklahoma State University. The attending veterinarian is involved at the protocol development stage, provides day-to-day (including weekends) clinical and operational oversight, and also conducts post-approval monitoring of animals at cage-side. In addition to offering barrier-quality services, comparative medicine also provides breeding and colony management, tail snips, injections, blood and sample collection, euthanasia, treatments, import/export, osmotic pump implants and customized services as needed. Staff also conducts no-cost training for lab personnel in areas ranging from basic animal handling to anesthesia and invasive procedures.